On 22-23 of September the Theological College of Gniezno has held a meeting of the Patristics Section of Polish Bishops Conference. The inaugurating mass was lead by Archbishop Dr. Wojciech Polak, Primate of Poland. During the meeting, President of the Learned Society of the John Paul II Catholic University of Lublin, Rev. Prof. Dr. Hab. 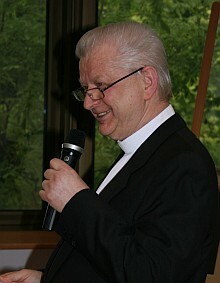 Augustyn Eckmann, was given an anniversary book - the annual "Vox Patrum" volume, written by friends and collegues of Rev. Prof. Dr. Hab. Augustyn Eckmann, to whom we send our deepest regards.